I designed a Pico-class Wind Turbine With Bicycle Wheel which is using Sanden made fan motor. The resulting power of this fan motor is not as big as the power produced by permanent magnet alternator. But fan motor as dynamo is much easier to apply and affordable. Fan motor is also much cheaper and easier to buy than treadmill motor. 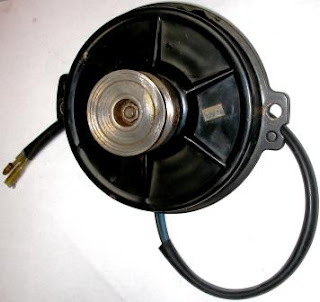 This fan motor is usually used to drive fan to blow ac condenser on vehicle. The photo below shows a fan motor with pulley mounted on it. On sedan car the fan motor is mounted behind the bumper, with a fairly low height of about 50 cm from the road. It is frequently exposed to water splashes, dirt, and even flooded. Positioned only a few centimeters from a hot radiator. But it proves that the fan motor is pretty tough. 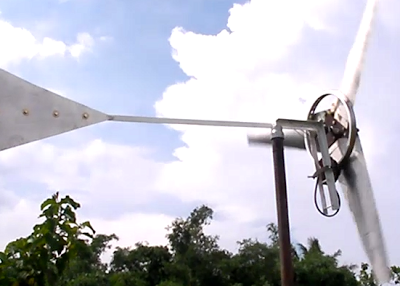 Dynamo on wind turbines should be weather proof as it is always exposed to the hot sun and rain-washed. 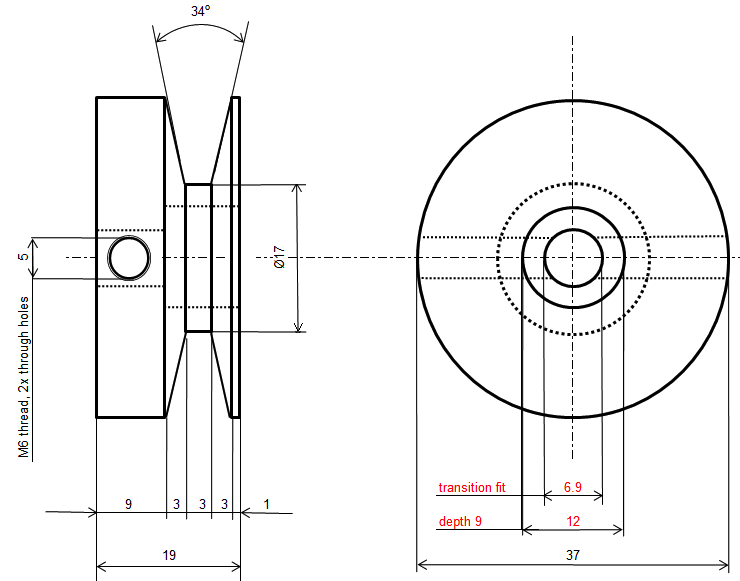 The above drawing is dynamo pulley detail. All units are in millimeters, red fonts need to be checked on the actual dynamo shaft, as it may be different. Scale does not exactly fit the actual. Pulley is locked with a 10 mm socket wrench nut on the shaft of dynamo, as shown in the above photo. It is using mild steel round bar as material. There are 2 set screws with allen key (hexagonal) on the side of the pulley as pegs and help to lock pulley. Allen key set screw shown in the photo below, with M6 thread diameter and length of approximately 15 to 20 mm. 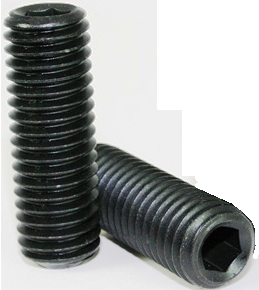 Set screw is fitted in a 5 mm diameter hole with M6 thread. This 5 mm diameter hole is bored through the side of pulley into the axle hole, continue to penetrate the opposite side of pulley, thus forming 2 holes for 2 set screws. When installing the pulley on dynamo shaft, position the set screw holes on pulleys so that those set screws will press flat areas on the shaft. Therefore both set screws will serve also as pegs to ensure dynamo shaft turn together with pulley. It can use other type of screw, but set screw looks more tidy. Dynamo is mounted on a fork-shaped frame of wind turbine. By using a clamp consisting of strip steel plate with 2 holes, and fastened to dynamo with 2 long 10 mm bolts (M6 thread). As shown in the photo below, Sanden dynamo has a round and flat body make it easy for installation. To connect the large pulley on the turbine with dynamo pulley, round thermoplastic belt is used with a diameter of 5 mm Bancord brand and green color. Green Bancord has a rough surface for better traction than the orange one (smooth surface). About 1 meter long belt with open ended as off as the photo below. This belt is connected by heating with a match. To ensure the required length of the transmission belt, position the dynamo in the middle of fork between the rim and the lower end of fork. Measure required belt length by a rope for flexible measuring tape. By positioning the dynamo in the middle between the rim and the lower end of fork, it will be a space to adjust the belt by sliding dynamo up and down. 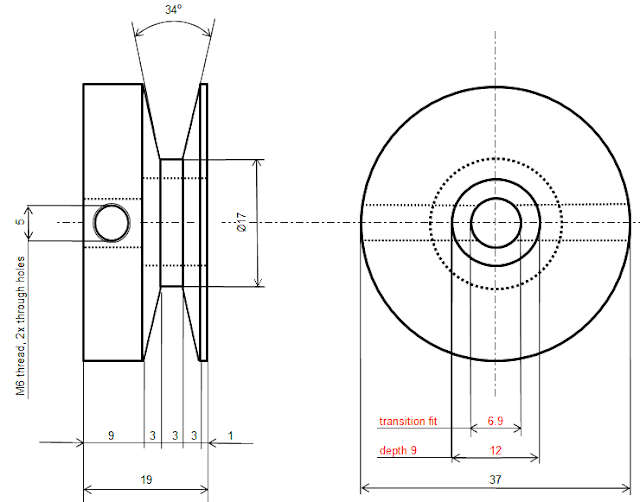 Too high belt tension will add more load to turbine, too loose belt will make dynamo pulley slip. Both condition will reduce dynamo power. Belt tension setting is done by shifting dynamo position at fork of turbine frame. Higher dynamo position will reduce tension, while lower dynamo position will increase belt tension. I usually use a rope to tie the turbine to stop it when adjusting belt tension. Before adjustment, put dynamo at slack belt position. Connect a 12 volts battery with abaout 5AH capacity to dynamo to make dynamo pulley rotated by that battery. Lower the dynamo slowly to brake pulley rotation by belt which is also can not rotate because the turbine is tied by a rope. Continue lower the dynamo until at a point where dynamo pulley rotation almost stopped as it braked by belt. Tighten two 10 mm bolts on the fork to hold dynamo at that position. Disconnect the battery cable to the dynamo. Be sure that two 10 mm bolts are already tightened. Remove the rope that binds the turbine so that the turbine can spin when the wind blows.